Featured on the iTunes App Store Navigation "What's Hot" list! If you have your iPhone with you, and this app, you can feel safe in knowing you could find your way, if lost with no cell signal. You can think of this app like you car tire changing tools, you hope you don't need to use them, but if you have a flat tire, you are so glad you have them! This app is one you can start and then forget about, but will be so glad you have it in the case of an emergency. We never "plan" to get lost. The one thing you usually always have with you is your phone. It is easy to forget your GPS when you go hiking, camping or a road trip. Most of the iPhone GPS apps and car help systems require cell service to fully work. This app does not need pre-loaded maps or a cell signal when lost! I use a brand new iOS 4 GPS feature that uses very little battery power, it checks for cell tower changes only. It saves the location of the closest cell tower automatically for you, as you walk/drive, all in the background. In the case you do get lost, the last known cell tower will be saved and ready! If you find yourself in an emergency with no cell service, re-launch this app back to foreground mode. 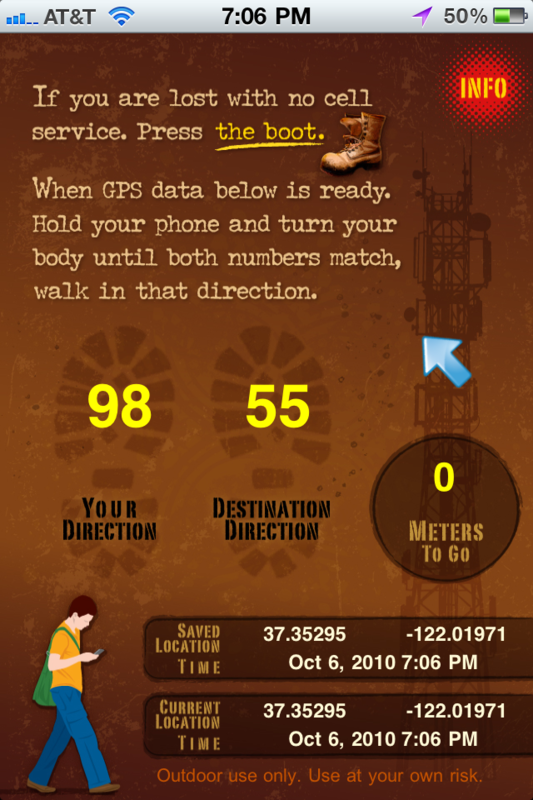 With one click on "the BOOT" icon, it will then show you the distance and compass heading back to the last known location where calls/texts can be made. This could be a real Life Saver! IMPORTANT: This app is meant to be an aid in finding a Cell Tower when you have no cell service. When people get lost, it is easy to walk in circles, or walk in the wrong direction. This app will provide a straight line heading from point A (where you are) to point B (latest saved location where cell service was active), this may not always be the best route. For example, it may be the direct route crosses a river. Common sense needs to be #1, and this app #2 when it comes to making the best decision. NOTE: I use a new 4.0 iOS feature "significant location changes" that uses very little (almost no additional) battery power. It runs in the background, but does not need to power up the GPS, so you do not need to worry about battery drain with this app.